Tracing Grace is the story of a young girl affected by encephalitis and the effect it has on her and her family. The play appeared at the 2016 Edinburgh Fringe Festival and our Annual Members' Meeting and was also performed at the ALRA Theatre, London, in February, 2017. The aim for the team behind Tracing Grace was to raise awareness and educate audiences at the world-famous arts festival about what it is actually like to have encephalitis. Feedback from the play has been outstanding and has educated many people about the impact that encephalitis can have on families. The Encephalitis Society has been delighted to support the Off The Wall Theatre Company and thank them for all their hard work. Dr Ava Easton, The Society's Chief Executive, is acting as mentor and consultant producer to the team. Annie Eves who is the writer, director and star of Tracing Grace has been kind enough to talk about the play, the story behind it and what it will be like to perform at the Edinburgh Fringe. Q. What can you tell our readers about Tracing Grace? Tracing Grace is the true story of a young girl who had encephalitis at just three weeks old. She is now eighteen. We are showing the effects the illness has had on her life so far, from not being able to communicate what she wants to say, to the anger pent up within her because she just doesn’t understand. We show the family’s point of view particularly through Annie’s eyes (me) and what it all means to her and what she thinks of the whole situation. Our hope is it will be extremely moving and will reach out to anyone who knows someone who has suffered from encephalitis and educate those who don’t... above all it is true and honest. Q. How did Tracing Grace progress from an idea to becoming a stage play? Well, I have performed at the Edinburgh Fringe before but this time I wanted to take my own show and I was trying to think of ideas of what to write about... and I thought what an incredible story this could be. I was unsure at first whether I wanted to write something so personal, but I feel as though I owe it to Grace as she suffered so severely because no one really knew what encephalitis was. So I want to raise awareness. Q. 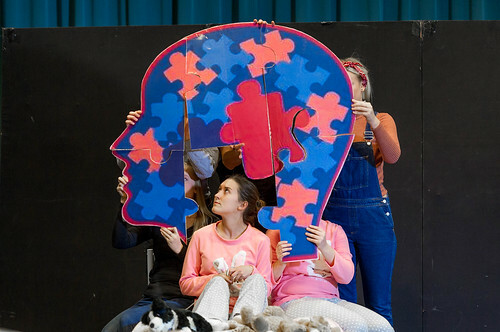 Do you believe theatre can be an important tool in raising awareness about conditions such as encephalitis? I think it’s the BEST way! People can get bogged down by the facts when reading information booklets and posters and like myself might switch off. Off The Wall Theatre Company is a completely new company that have come together for this show. The cast are multi-talented. We are all currently in drama school training in London from the crack of dawn until last thing at night, so it’s fair to say everyone is very passionate about what they do! Q. How is Tracing Grace coming along? We are just trying to work out an ending now - it’s very important to me that we get this right. I want the audience to go away and have felt something. The show is in great shape though and I am very excited for you guys to see it. Q. What do you think it will be like to step out on the stage in Edinburgh? Exciting, but also very nerve racking! This is very personal to me and I’m just praying it is received well. As long as we have an impact on a handful of people I will be extremely happy.